This is a review of Leading Edge Health’s Profollica Hair Recovery System. The company claims to promote growth of natural, healthy hair. They also claim to improve the length, quality, and density of your hair, in addition to aiding new growth in areas suffering from hair loss. Leading Edge Health also suggests that their Profollica Hair Recovery System can stave off the loss of hair color that comes with age, and help return the natural, elastic nature of your hair. Read on to find out more about this system & find out if it’s the right product for you. From what we could find on the manufacturer’s web site, it is suggested that you take 1-2 pills a day, with a meal. They suggest that, in order to see the full effectiveness of their Profollica Hair Recovery System, individuals should use these 2 products simultaneously, and for no less than 60 days to notice effectiveness. 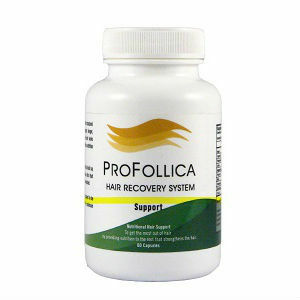 As the Profollica Hair Recovery System is specifically formulated for males, this product is not suggested for women. It is recommended that any individual should consult with a physician before starting a new vitamin regimen. From what we could discover on the company’s site, it looks like Leading Edge Health’s Profollica Hair Recovery System may have high enough levels of their active ingredients (most notably Niacin and Biotin) to have a noticeable impact on the human body. In addition to the standard supplement, the “activator gel” is a leave-in formula that may actually bolster the effectiveness of this system dramatically. No side effects are listed on the company’s web site, although caution is always encouraged when starting any new regimen. A single order of Leading Edge Health’s Profollica Hair Recovery System costs $59.95, and contains enough product for between 1 month’s supply. There are discounts available for larger orders, $159.95 for a 3 month supply (a $20 savings) and $299.95 for a 6 month supply (a $59 savings). The web site did not offer any sort of subscription for additional savings. Leading Edge Health advertises a full refund within 60 days of receiving your package, minus the cost of shipping. The return process and contact information of the seller is easily accessible from their home page. No customer reviews could be found on the company’s web site, or on any secondary seller sites. Leading Edge Health’s Profollica Hair Recovery System seems to be an above-average product. For what they offer, the price seems to be quite reasonable. Upon further research, we could find several indications that the doctor’s testimonials provided on the company’s web site were legitimate and reputable. Unfortunately, they don’t offer any sort of subscription service to add additional savings. Also, no customer reviews could be located on either Leading Edge Heath’s web site, or on any secondary seller sites. John Brownstone	reviewed Profollica Hair Recovery System	on June 28th	 and gave it a rating of 3.